At noon, even in a windowless room or outside on a cloudy day, one knows that the Sun should be somewhere overhead. It isn’t because of an unjustified belief resting solely on the faith that the Sun does what it does; it rests on repeated observations of the Sun doing what it does throughout our entire lives. As I read this, it once again raised the question in my mind: how can people believe in something that cannot be seen, heard, or felt (tangibly). The sun, at least, is visible and we are even able to “feel” its existence through the effects it has on our bodies (e.g., sunburn), as well as “see” its actions on the world around us. And when atheists assert that a person’s “relationship with God” is a fabrication or a construct of the mind, I believe they do so because there is absolutely NOTHING to prove that such a “God” exists in the real world. Essentially, belief in the Christian “God” — or any god, for that matter — is simply a result of superstition. That’s how it was from the beginning and that’s how it remains today. Early humans did not understand the constant changing of seasons, the movement of the sun, moon and stars, the storms, dry spells, floods, earthquakes, etc. And what they did not understand, they feared. As a way to help explain the world around them, they created gods. Knowing there was a supernatural being in control gave them a sense of security in the face of natural forces. This is still the case among many tribes throughout the undeveloped world. While “modern” folk now understand more about the forces of nature through (ahem) science (which some believers tend to discount), many still have a need for assurance that “something” is in control. This is why they “pray” to an invisible being to act in certain ways and why they “thank” this same unseen entity when things turn out in their favor. It seems the superstitious nature of the early humans is still present in our DNA. In today’s world, the concept of “God” is found in a set of books written by a number of different people and put together in a single volume (Hebrew Bible c. 250 BCE; New Testament c. 300 CE) by “church fathers” who felt they knew best about what this “God” was saying. 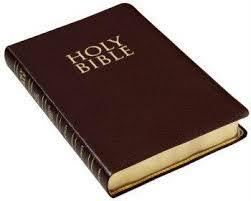 Many believe this book is “holy” and they refer to it frequently as “proof” their god exists. Yet it is a book. Nothing more. Just a book. It has no divine powers, just as its protagonist lacks existence. You say you believe in “God.” And I ask, who or what is “God”? This Newsweek article is well worth reading. It’s long, but it agrees with what many non-believers/atheists have said all along. With politicians, social leaders and even some clergy invoking a book they seem to have never read and whose phrases they don’t understand, America is being besieged by Biblical illiteracy. … religious convictions determined translation choices. … with a little translational trickery, a fundamental tenet of Christianity—that Jesus is God—was reinforced in the Bible, even in places where it directly contradicts the rest of the verse. So where does the clear declaration of God and Jesus as part of a triumvirate appear in the Greek manuscripts? Nowhere. Constantine was a brutal sociopath who murdered his eldest son, decapitated his brother-in-law and killed his wife by boiling her alive, and that was after he proclaimed that he had converted from worshipping the sun god to being a Christian. Yet he also changed the course of Christian history, ultimately influencing which books made it into the New Testament. And while the Bible mentioned nothing about the day of Jesus’s birth, the birth of the sun god was celebrated on December 25 in Rome; Christian historians of the 12th century wrote that it was the pagan holiday that led to the designation of that date for Christmas. The declaration in 1 Timothy … Those who “practice homosexuality” will not inherit the Kingdom of God. But the translation there is odd, in part because the word homosexual didn’t even exist until more than 1,800 years after when 1 Timothy was supposed to have been written. … there is one verse in Romans about homosexuality…and there are eight verses condemning those who criticize the government. In other words, all fundamentalist Christians who decry Obama have sinned as much as they believe gay people have. …the history, complexities and actual words of the Bible can’t be ignored just to line it up with what people want to believe, based simply on what friends and family and ministers tell them. Do You See Satan in Ezekiel? In a discussion on one of Nate’s posting at the Finding Truth blog, there was some discussion on the authenticity of Paul. Was he truly an apostle? Did he speak for Jesus? Were his teachings from God or were they his own? One individual claimed that Paul was a “false apostle,” and referenced Deuteronomy 13 as her evidence. After reading the chapter, I could see where she was coming from. However, as someone noted, these scriptures could be applied to any number of persons. Thing is, this is true of the entire bible. There are innumerable passages that can be interpreted innumerable ways. How can we know which interpretation is correct? Christians will say the “Holy Spirit” will reveal the truth. Er … well … OK.
I’d like to offer my own perspective on another passage of scripture related to the existence of “Satan.” This is from Ezek. 28:11-19. 12 Mortal, raise a lamentation over the king of Tyre, and say to him, Thus says the Lord God: You were the signet of perfection, full of wisdom and perfect in beauty. 13 You were in Eden, the garden of God; every precious stone was your covering, carnelian, chrysolite, and moonstone, beryl, onyx, and jasper, sapphire, turquoise, and emerald; and worked in gold were your settings and your engravings. On the day that you were created they were prepared. 14 With an anointed cherub as guardian I placed you; you were on the holy mountain of God; you walked among the stones of fire. 15 You were blameless in your ways from the day that you were created, until iniquity was found in you. 16 In the abundance of your trade you were filled with violence, and you sinned; so I cast you as a profane thing from the mountain of God, and the guardian cherub drove you out from among the stones of fire. 17 Your heart was proud because of your beauty; you corrupted your wisdom for the sake of your splendor. I cast you to the ground; I exposed you before kings, to feast their eyes on you. 18 By the multitude of your iniquities, in the unrighteousness of your trade, you profaned your sanctuaries. So I brought out fire from within you; it consumed you, and I turned you to ashes on the earth in the sight of all who saw you. This passage has long been accepted as pertaining to the “Big Bad Guy.” Even though the words, “devil,” “satan,” or “fallen angel” are nowhere to be found, scores of Christians are certain Ezekiel is writing about “someone” other than the person named in verse 12 (the king of Tyre). What’s interesting is that throughout his book, Ezekiel speaks to several foreign rulers. So why do believers isolate this message written to the leader of Tyre and assign it a second meaning (i.e., Satan) — especially when Ezekiel specifically says he’s speaking to a mortal? Through extensive reading and research. I discovered this idea came from the writings of Origen of Alexandria, one of the early church fathers. It was his contention that Ezekiel could not possibly be talking about a human being and therefore must be referring to “some superior power which had fallen away from a higher position,” and who was then converted into a “wicked being.”(1) In case you don’t know this Origen fellow, he played a major role in the formation of Christian doctrine. In fact, it was his viewpoint on this matter (among others) that set a precedent in early Christianity, and remains the accepted teaching in many churches today. What do you think? Is Satan in Ezekiel? I discuss more on this topic in my book, along with several other passages that believers contend are about “Satan” (Garden of Eden, Book of Job, Lucifer in the Book of Isaiah, Revelation). I think many will be surprised at what I learned.